Look at the color of that silver! Using liver of sulphur, I blackened it to perfection. You've probably admired gorgeous patinated jewelry and wondered how that’s done. The basic formula is to darken the metal, then polish it so that the crevices are darker and the raised surfaces are highlighted by contrast. This tutorial walks you through the first step - the blackening of the metal. Oxidizing with liver of sulphur works for copper, silver, and brass. Copper is very quick, silver takes longer, and brass takes the longest of all. Liver of Sulphur is a chemical that usually comes in lump form. It looks like chunks of rock and stinks, well, like sulphur.... go figure:) You can buy it from a jewelry supply or a loose diamond supply vendor (I get mine from Lacy and Co. in Canada). When you open the jar, you will see sharp lumpy rocklike chunks. Before I knew what it looked like, I had always wondered so I took a picture for you. Here are the steps I use to oxidize silver and copper. Note: *Always remember to use gloves and proper ventilation whenever you handle any kind of chemical. Step 1: Put a pea-sized chunk in a glass bowl that is big enough to hold the item you wish to oxidize. Break up a bigger piece if necessary by smashing it with something hard. Step 2: Fill the bowl with hot tap water. 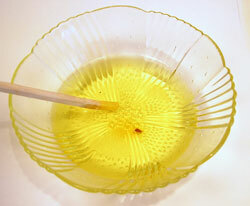 Step 3: Stir the water with your chopstick or plastic tongs until the liver of sulphur lump dissolves. Step 4: Put your jewelry into the liver of sulphur bath leave it there until it darkens to your satisfaction. The longer you leave it, the darker it gets. The silver may turn yellow, then purple and blue before it turns black. This is normal. It may take 2 minutes or 20 or 30 minutes to darken sufficiently. Step 5: Take your item out of the solution and rinse it well with water. I use hot water and then cold when I rinse. Step 6: I flush the solution down the toilet when I no longer need it. It's a very dilute solution so I've never been too ecologically concerned about it. Oxidizing seems to work better if you can keep the solution hot. I use a coffee cup warmer under my glass bowl. 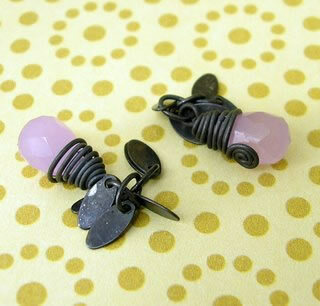 Oxidizing wire beforehand is a great time saver and has no effect on the finished jewelry in my opinion. I always make up a new solution when I oxidize. I don’t know what happens if you try to reuse the solution but the chemical is so inexpensive I have never looked into reusing it. Polishing your finished oxidized jewelry creates depth; the crevices remain dark, while the shininess of the raised polished parts of the piece add extra interest. Using a tumbler to polish is another great time saver that imparts a beautiful shine not easily accomplished when hand polishing. You can also get liver of sulfur in liquid form. I've had good results using both the liquid and the lump. The lump form will last a lot longer and is much more cost-effective if you're going to do a lot of oxidizing. The liquid form is a little easier to use because you don't have to dissolve it first.